The ultimate piston-engined heavy bomber of World War 2, the first production B-29s were delivered to the 58th Very Heavy Bomb Wing in the autumn of 1943. By the spring of 1944 the Superfortress was bombing targets in the Pacific, and by war's end the aircraft had played as great a part as any weapon in ending the conflict with the Japanese. Indeed, the final dropping of two atomic bombs from the … B-29 convinced the Japanese to sue for peace. 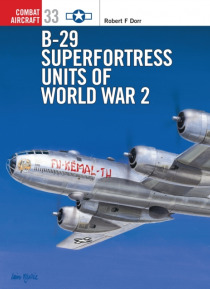 This book traces the wartime career of the B-29, as the aircraft went from strength to strength in the Pacific Theatre.